The three young African men cut striking figures under the sunny bright blue morning sky in St. Peter’s Square in Rome. They walked tall and proud, showing off maybe a little bit, in their Caritas campaign T-shirts, their smiles big and their enthusiasm for life huge. 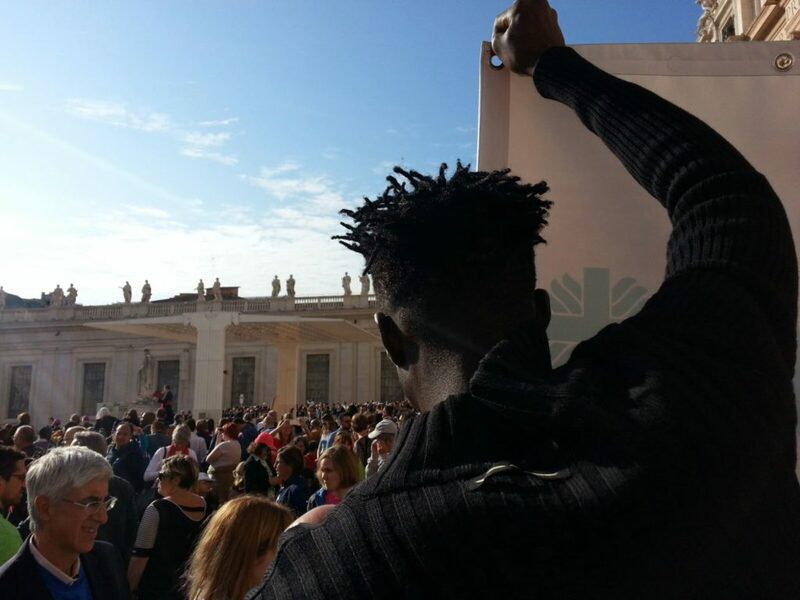 They had just experienced something they could never have imagined during their hard migration journeys from West Africa to Italy: sitting amongst Pope Francis’ special guests at his Wednesday General Audience at the Vatican. The three young men – Yancuba, Amadou and Berete – were there to help launch Caritas’ ‘Share the Journey’ campaign. The two-year campaign aims to build relationships between refugees, migrants and local communities and to advocate for safety and protection for people on the move as important new international agreements (known as the UN Global Compacts on Migrants and Refugees) are being negotiated for adoption in September 2018. Yankuba chatted amiably in excellent Italian with his two new friends in their ‘Share the Journey’ T-shirts, after taking part in a press conference to launch the campaign. He was also excited to discover that Amadou of the yellow T-shirt, aged 20 and from Senegale, shared his surname – Garboe. As Gambia is surrounded by Senegal they pondered if some of their relatives had made a previous migration. “We’re going to keep in touch and try to find out if we are distantly related,” beamed Amadou. Yankuba was returning to Benevento near Naples, accompanied by a team from the local Caritas which had joined in the ‘Share the Journey’ campaign launch. Caritas Benevento helped pay Yankuba’s school fees and is now supporting him in his biology degree, a stepping-stone he hopes, to his dream of becoming a doctor. Yankuba makes sure to give back to Caritas, volunteering in projects, including cooking meals for unaccompanied children. The Caritas team members had watched – glowing with pride – as he confidently gave television interviews. In Pope Francis’ ‘culture of encounter’ (the inspiration for Caritas’ ‘Share the Journey’ campaign), host communities as well as migrants and refugees benefit from the relationships and bonds formed. The supportive smiles of Caritas supporters brought alive just how real this two-way street is, how sharing the journey really works. Amadou also gives back to Caritas Palestrina, which has supported him. He works in volunteer programmes, and is involved in inter-faith dialogue. A Muslim, Amadou’s father was an Imam. It was when he died that Amadou set out in search of ways to support the rest of the family. Arms crossed thoughtfully across the chest of his orange ‘Share the Journey’ campaign T-shirt, 23-year-old Berete Ibrahima listens carefully, with a shy smile. He left Guinea when he was 16, crossing through Mali, Algeria and Libya before the war there forced him to sail to Lampedusa. Arriving near Naples, Caritas Aversa helped him access education and then a catering apprenticeship. He now works as a chef’s assistant, but continues to volunteer with Caritas Aversa. Showing their gratitude with concrete involvement is important to Berete and the two other young men. They also want to build relationships, to make the ‘culture of encounter’ a reality.